In 2017, Central Co-op shared the results of our first Impact Study, which gave hard numbers to the positive effect the co-op has on our state. This year, we asked Civic Economics to update this study in order to show the ripple effect that the Co-op's progressive compensation package and support for local producers have on our economy. 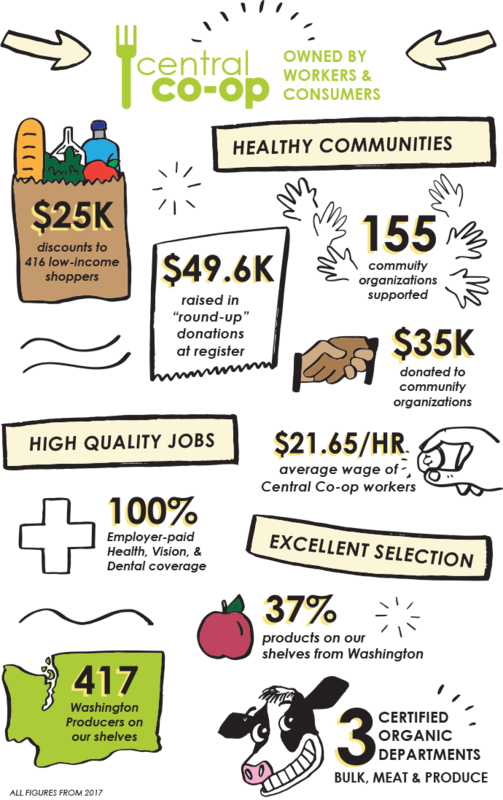 The result: The report found Central Co-op’s economic activity generates an additional $8 million in Washington’s local economy compared to a conventional grocery chain store! With an average wage of $21.68/hour, Central Co-op’s wages are a full 27 percent higher than the statewide average for grocery stores. This study shows that we are putting our cooperative principles into action for tangible results that go beyond the walls of our Co-op. These results demonstrate the power of community ownership and democratic governance as we put the values of our community to work in our Co-op! Congratulations and thank you to all our members! The two major ways that the Co-op achieves this is by hiring full time employees on living wage principles and by going out of its way to ensure Washington producers and suppliers are used whenever possible. This recirculation allows money to churn through the region, creating revenues used to build and support the roads, schools, bridges, and libraries that make this the vibrant community that it is today. A full updated 2018 study is coming soon!